Quick! Your car or your smartphone? No, this isnâ€™t a poorly worded stick-up. We are merely asking which is more crucial to the smooth running of your everyday life â€“ your motorcar or your mobile? Whether youâ€™re a petrol-head, technophile or heady combination of the two, itâ€™s not an easy question to answer. Thankfully, we donâ€™t have to choose â€“ provided we donâ€™t use both at the same time (letâ€™s get that little disclaimer right out of the way, shall we?). So, with the link between vehicle and phone having promptly progressed from puppy love to long-term relationship and now on to full-blown marriage, we thought itâ€™d be fun to chase down some truly weird and wonderful applications currently available to motorists. Some are silly, some are fun, and others are actually quite useful. Weâ€™ve deliberately steered clear of run-of-the-mill GPS applications â€“ despite the fact that some of them are exceptionally handy and well devised â€“ preferring instead to concentrate on the slightly more bizarre alternatives. Stuck in traffic? 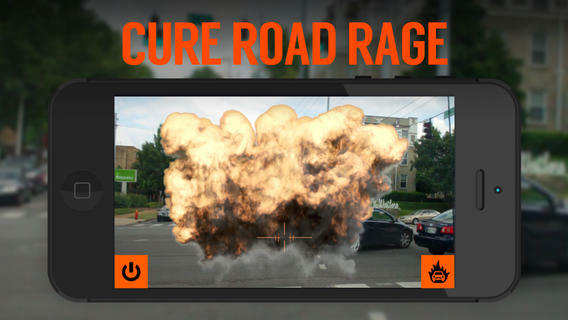 Prefer your road rage in augmented reality flavour? This explosive app may be the answer. It transforms the gridlocked road in front of you into a vehicular warzone, allowing you to ease your frustrations by â€œblowing upâ€ anything in your path. Itâ€™s voice-activated, too, which means all you need do to unleash the pain is yell â€œfire!â€, preferably with an angry look on your face. It goes without saying (but weâ€™ll say it anyway) that you shouldnâ€™t fiddle with your phone while driving â€“ even if itâ€™s dash-mounted. Okay, so itâ€™s a little cheesy. Well, cheesier than a chunk of Parmesan-covered cheddar, if weâ€™re honest. But for those of us who will likely never experience a supercar from behind the steering wheel, it may well be the next closest thing â€“ for our ears, anyway. XLR8 uses your phoneâ€™s accelerometer to respond to acceleration, braking and cornering forces, sending a suitably sporty backtrack to your carâ€™s stereo system. Yes, that means your rust-riddled hatchback can sound like a classic V8. Itâ€™s worth noting, however, that any additional engine sounds (NASCAR, Ford GT40, Ferrari and Lamborghini) have to be purchased. There are a number of apps out there that help the motorist with a poor sense of direction to find his or her way back to their parked car. But none of them are quite as fun as this one. You see, Carrr Matey is pirate-themed (as you may have guessed from the name) and helps the captain (thatâ€™s the driver) pinpoint the location where the ship (yip, the car) is docked. Itâ€™ll spit out map directions and provide compass navigation, and even features a built-in parking timer. And, yes, itâ€™s available for Andrrrrrroid. Unless you happen to drive a range-topping luxury car, youâ€™re unlikely to get much â€œreal-time object detectionâ€ action out on the road. 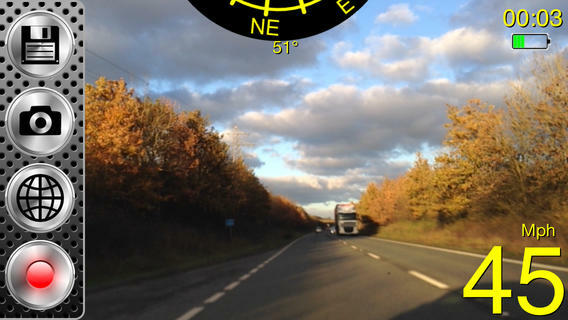 But the latest version of this nifty app (which dates back to 2010) changes that, detecting and highlighting other vehicles and displaying following distances when your phone is mounted on your windscreen. 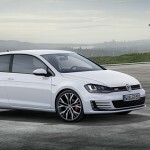 It also includes a lane departure warning system, speed warning system, and safety scoring function. 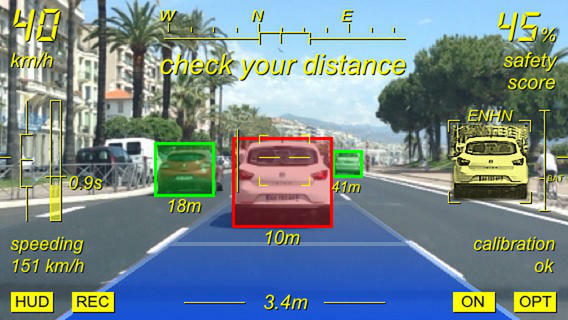 A similar app dubbed â€œiOnRoad Augmented Drivingâ€ is available for Android users. Okay, so it potentially helps motorists to break the speed limit and not get caught â€“ but it does so by pointing out speed cameras, which tend to be placed in high-accident areas that require a reduction in speed anyway. 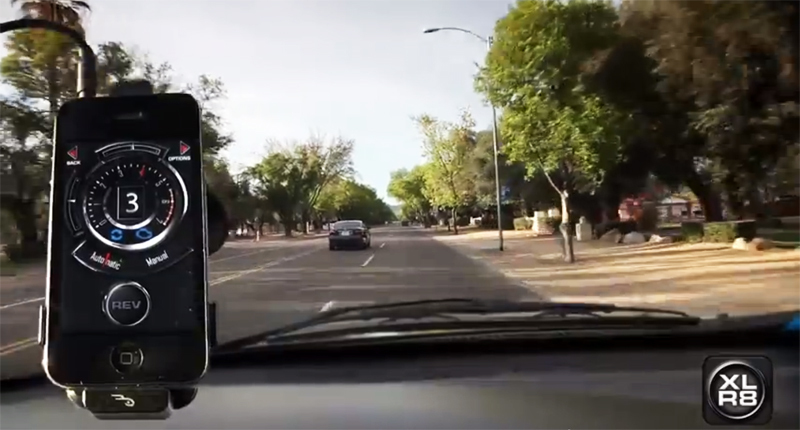 Users of the Trapster app (there are apparently over 20-million worldwide) work together to report static and roving speed traps as well as other hazards, such as crashes, construction zones, and traffic jams. In addition to visual warnings, the app delivers audible cautions, which means your eyes neednâ€™t stray from the road. Dynolicious is a bit of a classic and a long-time favourite of the petrol-head community. And now thereâ€™s a next-generation version called â€œFusionâ€. This app employs your iPhone’s accelerometer, gyro, compass and GPS to generate pretty accurate performance test results, including sprint times, elapsed times (e.g. over a quarter-mile), power at the wheels, and g-force. It also connects to a dedicated social network to facilitate the posting of your rideâ€™s results, photos and anything else you wish to share. Not only does this app measure your vehicleâ€™s performance (power, torque, sprints times, boost, etc. ), it also doubles as a diagnostics tool. Thing is, youâ€™ll need to buy an OBD II (on-board diagnostics) Bluetooth adapter to connect your Android phone to the carâ€™s ECU to make full use of Torque Proâ€™s abilities. But it may just be worth the extra expense, since the app allows you to check and clear fault codes, potentially saving you plenty of cash that would otherwise go into your local car dealerâ€™s pocket. Thereâ€™s even an overheating warning and a head-up display function for night driving. iWrecked is one of those handy apps that youâ€™ll want to download, forget about and hopefully never have to use. The first version debuted as long ago as 2008, so the latest edition is pretty darn refined. What does it do? Well, it facilitates the easy logging of all necessary information when youâ€™ve been involved in a road accident. From this, it can generate a detailed PDF accident report with images, which you can fire off directly to your insurance company. Additional features include integrated emergency numbers and a service that locates nearby taxi or towing companies. If youâ€™re an automotive enthusiast, chances are that the shortest route to your destination is not always the best. Sometimes, youâ€™d rather take your performance vehicle along an amazing driving road rather than straight down the highway. And thatâ€™s exactly what this app delivers â€“ the most fun and scenic routes according to other motorists (from some 160 countries) who use Greatest Drive. Each road is assigned a total score out of five based on individual tallies for fun, twisty, scenic, and traffic. This oneâ€™s been around for a couple of years, but itâ€™s certainly worth a mention since it does the job of a pricey dash-cam for a remarkably small outlay. The app facilitates the recording of up to an hour of video â€“ in a rolling loop to save on memory â€“ which can be especially useful when it comes to proving exactly what happened in a minor crash. Of course, it also allows you to catch any of the vast number of bizarre tarmac occurrences that take place every day â€“ even if you happen to live outside of Russia. If youâ€™ve lost your garage door remote, or simply love geeky apps, then this oneâ€™s for you. It uses your phoneâ€™s internet connection to access your home network and control any devices paired to your controller. This means you can open or close your garage door (or operate lights, alarm systems, etc.) from virtually anywhere. It can even send notifications each time the door is opened. There are a number of similar apps, also available across other platforms, from which to choose. Bear in mind, though, that most â€“ including MyDoorOpener â€“ require modification of (or addition of a relay unit to) your existing door unit. Any long trip can be ruined by a rapidly filling bladder â€“ be it your own, or one belonging to a passenger. This user-contribution app makes it simple to pinpoint the nearest public bathrooms, ensuring you can quickly get back to doing what you enjoy most â€“ driving. It provides each looâ€™s address as well as whether or not youâ€™ll have to pay for the opportunity to relieve yourself. Thereâ€™s also the delightfully named SitOrSquat app (which appears to be restricted to the US), which allows you to rate each restroom.